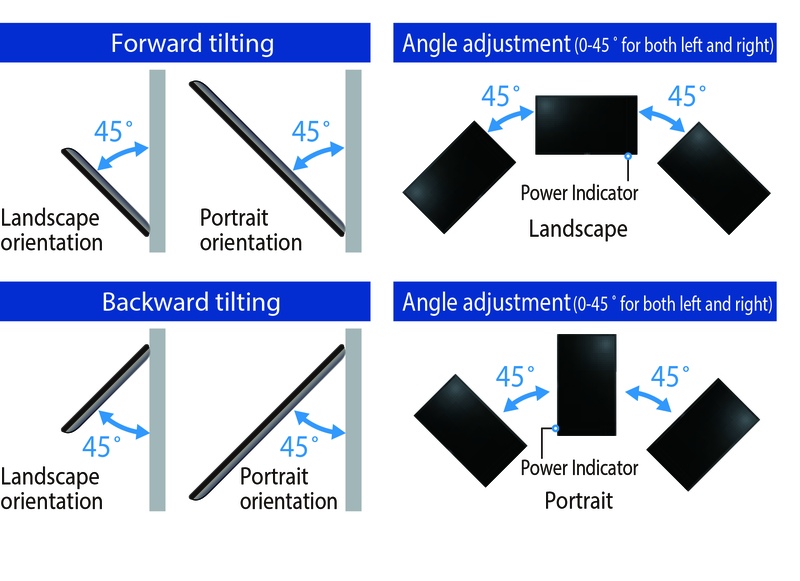 Panasonic has developed a unique, high-speed backlight control technology, which allows the transmission of digital content using the light emitted by the display and a mobile app. The ID signals transmitted from the screen are read by the smartphone* on which the user will immediately view interactive and customized information, such as as traffic guidance or marketing incentives for instance. The displayed content can also be delivered in the smartphone owner's native language. Users receive content quickly, easily and securely through a simple, fast, intuitive and impactful experience. *Panasonic provides a free dedicated LinkRay Solution app for iOS/Android™. Panasonic also provides an SDK (Software Development Kit) that enables collaboration with third-party app developers. The SF1H series features a USB media player. This makes Signage operation easier, by simply inputting the desired content (still images or videos) to be displayed via USB, eliminating the need for a set-top box. The content on the USB memory can now also be used in combination with LinkRay ID signals*, to configure an interactive signage system. *A separate contract for a Light ID license must be concluded with Panasonic to configure a LinkRay system. Multiples Light IDs can be individually linked to match with each content shown on the display. This allows more information to be delivered on a single display. Content is delivered from a single PC to multiple displays on a specified network. With Multi Monitoring & Control Software, it is possible to remotely change the content of the USB memory via LAN after installation. Content can then be changed even when the display is not easily accessible. Data can be delivered according to a schedule enabling smooth and easy operation. •Synchronized playback is not possible. There is very little change in colour, compared with the VA panel, when the screen is viewed at right or left angles, so the images are crisp and clear. This is ideal for providing correct information in crowded places, such as public spaces and facilities. In addition, the powerful image engine allows to provide the highest picture quality, by automatically refining image parameters such as colour tone, colour density or brightness level, as well as correcting imperfections like blurry contours and noise effects. The SF1H Series is designed for use in either portrait or horizontal orientation with no effect on panel colour and lifespan, further reducing TCO. A tilt installation up to 45 degrees forward or backward is also possible. The angle can be adjusted for easy viewing when installed in a high location. The use of highly durable panel materials and quality electronic components ensures dependable 24-hour operation seven days a week. This makes the SF1H Series ideal for installation in retail, hospitality, transport, entertainment industries, and other applications... where absolute reliability is critical. Using DIGITAL LINK makes it possible to transmit video, audio and control signals over a long distance (up to 150 m (492 ft)) with a single LAN cable. *1 Easy cabling also reduces labour during setup. This provides transmission of high-quality images and sounds, as well as remote control. *1 When connected with the [Long reach] mode, the maximum transmission distance is 150 m (492 ft). In this case, the unit can receive the signals of up to 1080/60p. A CAT5e (STP) cable or higher is required. You can easily copy the setting data of a master display to other displays using USB memory. This saves labour when making screen settings during the installation of multiple devices. function, the status of multiple devices can be listed in groups, and then detailed information on each device can be separately displayed. As a control function, control commands such as power ON/OFF, input switching and command inputs can be executed, and a schedule function can be used.